Metric: Runestones. So many potential metrics to choose from but this one fits best. Incidentally, you can pronounce þ as 'th', it's close enough for government work and around the gaming table. Overall: 5 runestones (a cunningly wrought dragon-hoard of Northern delight) An innovative treatment of the Northlands for Midgard inspired by Norse and Viking myth flavoured with steppe Russian, Finnish and Inuit culture. Being a bit of a Norse snob, this was a joy to read and as usual if you can't use it all, then you can certainly plunder the choice bits of this hoard. An abundance of material in here means there's plenty to go round. Content: 5 runestones (it just doesn't stop). Riddles of Steel: Roleplaying In The North is an overview of the hard land and it's hard people. A glossary of the language, and definitions of concepts like drengskapa (integrity) and niþ (dishonour) leads into a well-written overview of Northland culture, games (yes, that includes drinking), the gods and their favours as well as reasons to interact with Zobeck and other parts of Midgard. Thule: The Last Continent is a treatment of the Northlands, including the troubled relationship between dwarves, giants and humans as well as the awakened bears and wolves who reign over their own kingdoms. From Trollheim to the magical realms of Jotunheim to the strange lands of Hyperborea and the World's End, myriad adventure hooks waiting to snare characters. Heroes of the North creates characters for Northlands games. Human sub-races range from Kazzakh riders, to Donneren barbarians to Skraeling hunters and Trylleri woodfolk. Additional races include reaver dwarf (hard-hearted raiders), troll-kin (those with fey or giant parents) and Hyperboreans (a dualist magical race changed by the Northern lights). Classes have nice twists - bards become skalds, barbarians shapeshifters, wild riders or hoary berserks, monk glima wrestlers, sorcerous bloodlines (Hyperborean and giant) and the oracle and witch from Advanced Player's Guide reskin as völva and seiðr-users. Achievement feats where heroes earn favour and do great deeds for them are a great idea. Rune feats and invocations also feature. Equipment and materials round off a crunchy chapter including double mail, scramasax, howling standards and prismatic iron. Magic of The North introduces the concept of grudge magic, adds the power of runes, then includes spells ranging from fire under the tongue to create tupilak to triumph of ice, then adds magical items ranging in strength from runic talismans to apples of youth. There is a versatility of magic here which if added to the usual range of spells and powers may make surprising combinations yet numbers are consistent with equivalent bonuses and if you're playing the epic setting of Hyperborea would certainly be in keeping. Tellingly there's a number of evil or cursed items which are still nice to have. This maps nicely to the double-edged benefits of magic found in the cultures inspiring the book. The Frozen Land presents GM-friendly setting information ranging from dog-sled chases to environmental threats and Fate Afflictions (the ironic yet sinister turns of fate that lurk in Norse stories) which provide some temporary boon in return for portentious stuff later. Environmental hazards ranging from ghost of a broken blade to vaettir's wrath make for dangerous encounters. This is an unforgiving land and GMs are reminded of this by the atmospheric and deadly nature of the challenges. Bestiary has some real prizes for the GM needing monsters. From the thursir giant to krake spawn to the tupilak golem to the valkyrie, there are wonderful encounters in the making. The vaettir will guarantee undead are respected again by your party. My personal favourite is the nightgarm, just for the sheer horror they will bring to the party. A lot of traditional Norse monsters are already in the core rules so if this feels a little light there's plenty of other things to add in courtesy of the Pathfinder Bestiary (and volume 2). Plus the Kobold Quarterly site will not let the opportunity slide. Layout: 4 runestones (beautiful cover, clean layout). The cover is magnificent work by Aaron Miller and captures the chill nature of the Northlands; inside there is the appearance of Arthur Rackham (of all people) and darker, more traditional fantasy Viking-style artwork from Rick Hershey. Tables and other accoutrements are well-formatted and cartography once-again excels. In closing, the quality of this book is remarkable by the fact Dan Voyce is relatively new to this (could've fooled me). 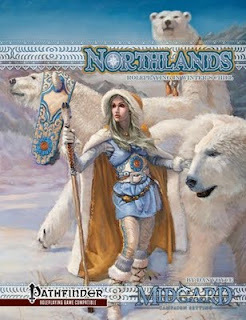 There is enough content that the Heroes of the North and Magic of The North chapters would be a sourcebook if this were published by other companies. Of course, you get more still. While using Norse phrases (e.g. dróttkvæts) may not suit everyone, there is enough awesome in this book to forgive that. Also, to paraphrase Stan Lee, if they're diving for a dictionary every once in a while, that isn't always a bad thing. It's nice to see a sourcebook that encourages a little effort to immerse the reader in the culture inspiring it.